Work No. 772; Lady Lady in the Hall..
Lady Lady in the Hall, Which is the Fairest of Them all? Lady in bus shelter; North Finchley terminus, London N.
continuation in ” They Who Have Seen the Light” . can define – along often vaguely menacing cinematic archetype lines – how an individual’s character is perceived. 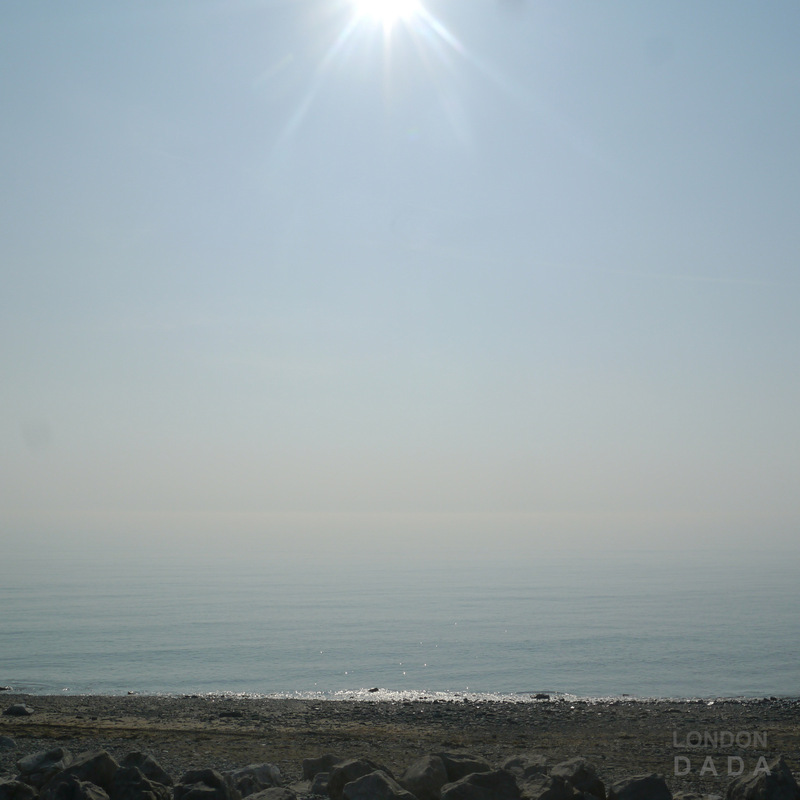 London Dada – true perception and criticism of our times. Work No 770; She don’t wanna know M8. ( summer solstice, longest day ) ..and inexorably begins its reverse movement back again towards the winter solstice – its maximum tilt away from the sun and giving the shortest day in the northern hemisphere. The Two works to be offered as a unique diptych of 20 signed edition Lightjet prints. Banksy’s ‘Balloon Girl’ in appropriation with sobering additions to bring into line with current global trends regarding war and occupation and its effect on children who are tragically caught up, scarred and abused in such conflicts. Also relating to corporate aggression against the individual and his/her human rights via imposition of monstrous social conditions including zero hours nil rights forced slavery. Photo montage; re-photographed & spray-printed onto canvas. 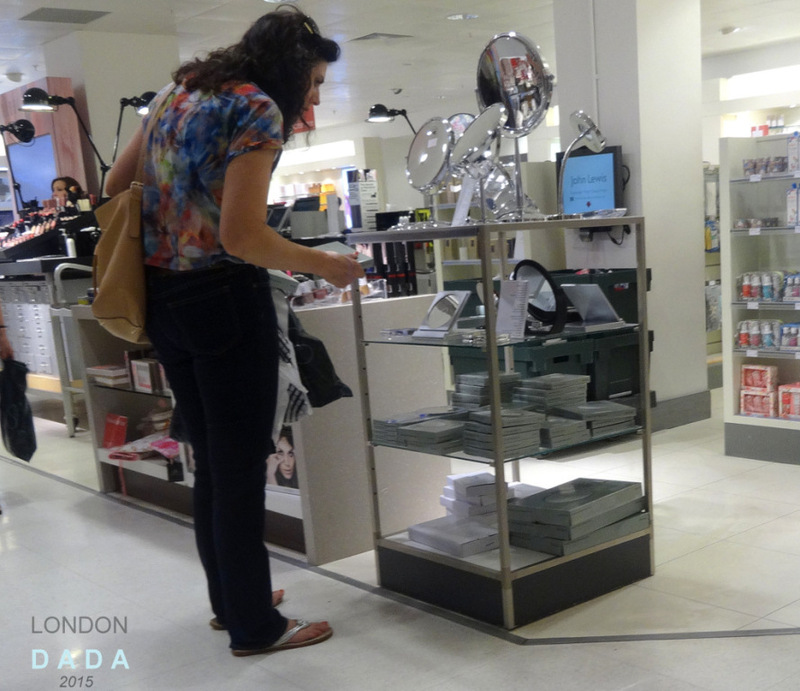 Introducing Infinitude III, the Digital (Pixel) Mirror. Bringing the virtual world into the physical. x100 2″ sq mirrors arranged on a back panel to form a 20″ sq mirror, each square being infinitely adjustable via a universal joint on its reverse centre point of adhesion to the panel so as the whole mirror produces an infinite variety and juxtaposition of its 100 individual physical pixel reflections according to each of its component pixels’ (mirrored squares’) manually-depressed angle of any of its 4 outside edges or corners through the horizontal plane, giving a playful hide and seek-like experience. 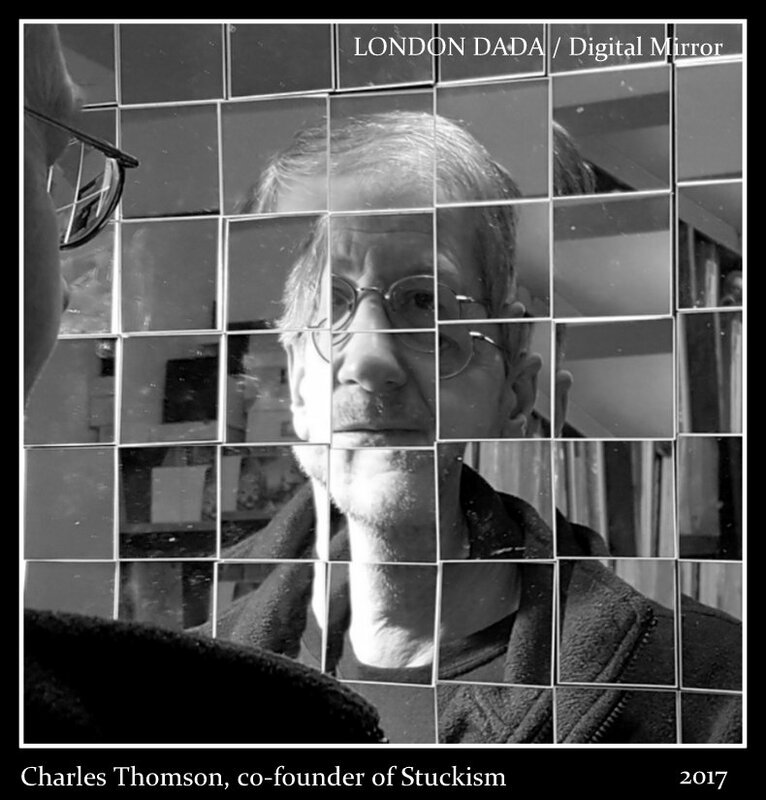 Charles Thomson, art critic and founder of Stuckism in the digital mirror ( top ). 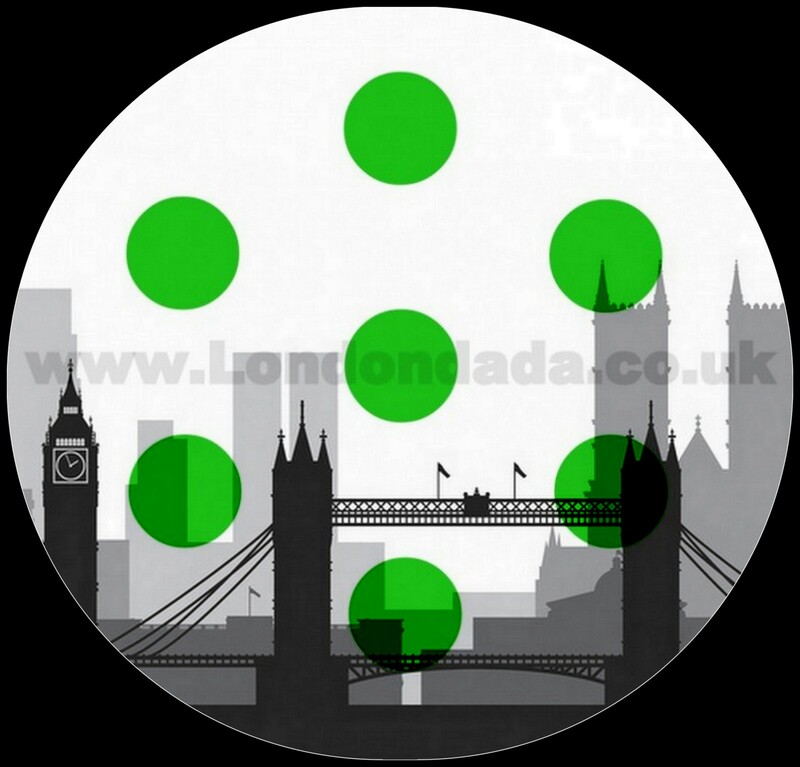 * Linkback to Infinitude II the artwork that inspired an Olympics. 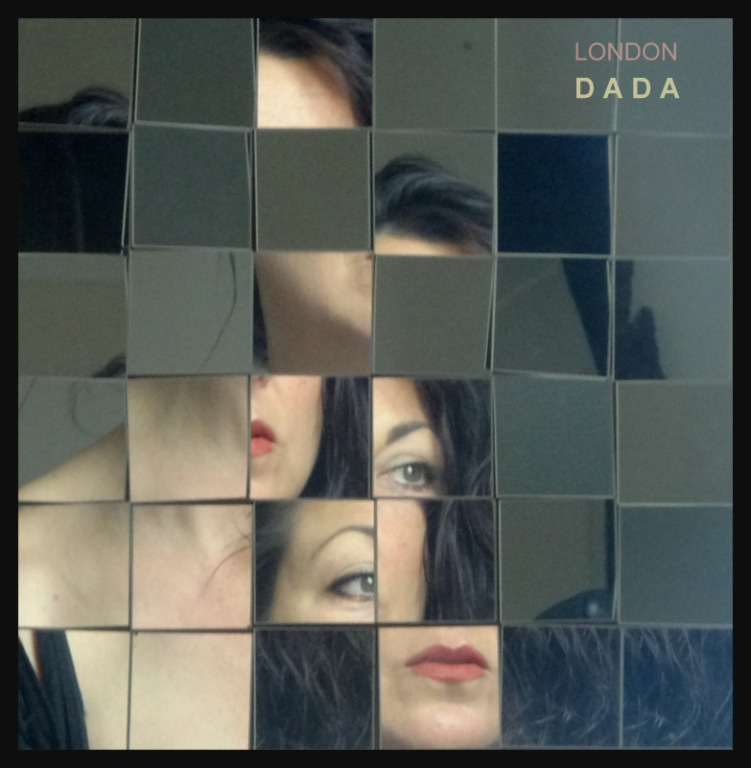 Artist call London Dada are offering an affordable photo portrait shoot in the physical pixel deconstructist Digital Mirror TM during summer / autumn 2015. 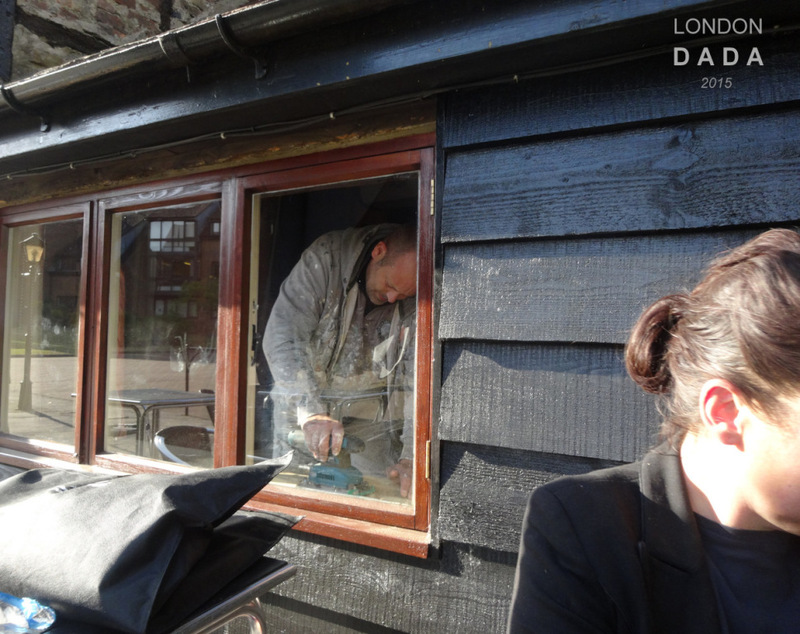 A triptych of images ( smaller scale example above, minus the camera ) will be procured in a Shoreditch rooftop setting featuring backdrop of the City and the Shard; each image similar yet with distinctly different positional features, while retaining the sitter’s essential character. 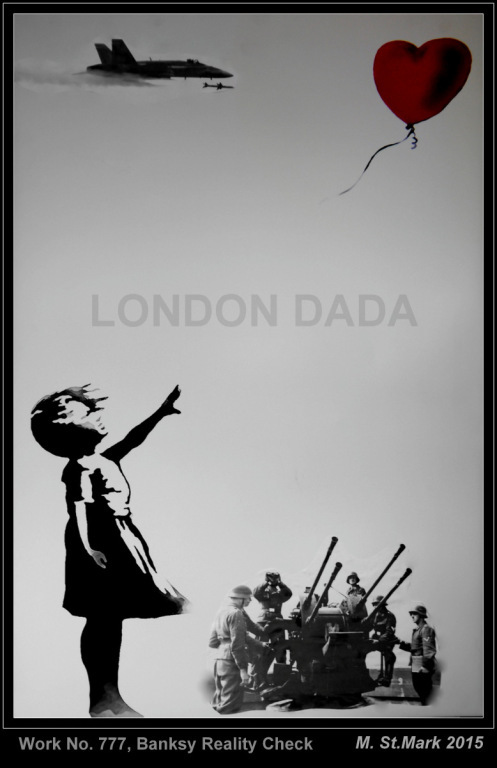 Limited to the first 50 artists to apply; prints will be named, numbered and watermarked LONDON DADA 2015. 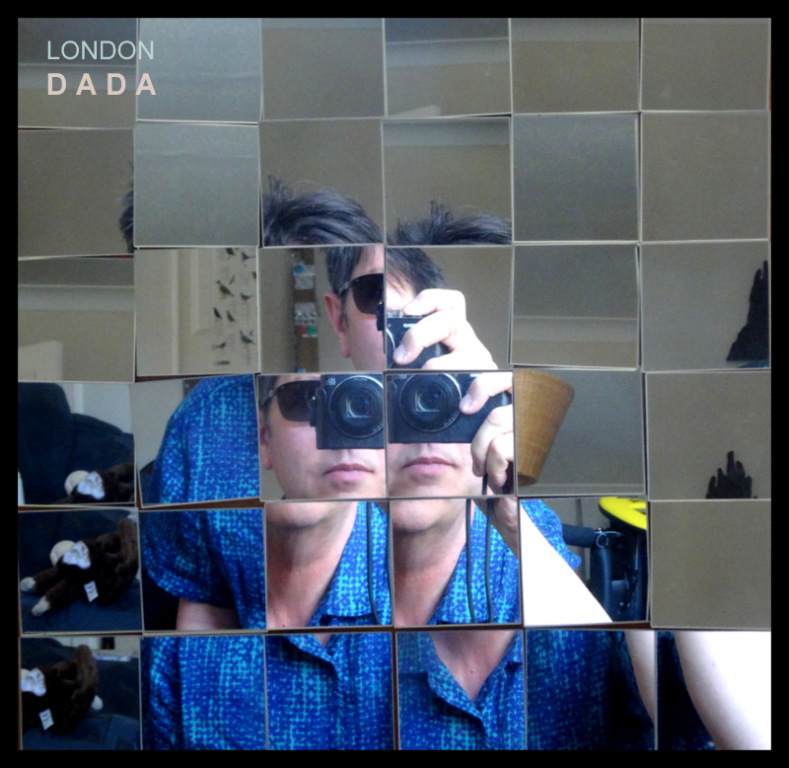 Update; 03 / 2016, the following year from release of the Dada Digital Mirror…. 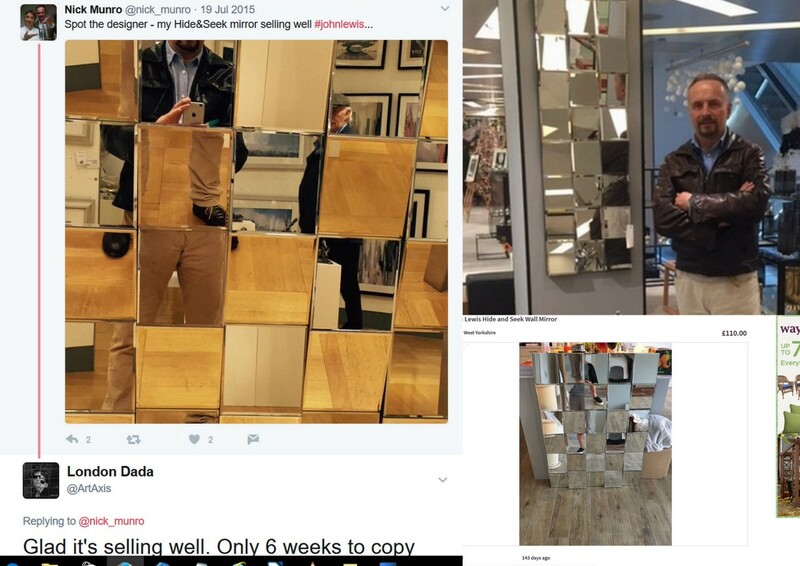 Self portrait / Hidden pulse, gif by Atacart ( 2016 ), that he keeps as a retweet & follower-accumulating pinned headline lead-in image on his Twitter timeline. A direct copy of Infinitude III; The Digital Mirror by Michael St.Mark, made up into a simple gif by randomly moving some of the mirrored squares – as is exactly the function of Digital Mirror – and re-photographing it. Carsten Holler’s Travelling Beds – the art of entertainment. Carsten Holler – more deviser of turnstile-clicking quirky funfair attractions than artist of perception or innovation? “The customary “look but don’t touch etiquette for art exhibitions is about to be torn up at the Carsten Höller show in London, where members of the public will be invited to spend a comfortable if discombobulating night stretched out in one of the works  a bed which will pass the hours of darkness trundling slowly around the exciting Hayward Gallery. The price, at £300 for two beds, is comparable to an expensive London hotel, but even the most luxurious accommodation rarely includes slides which are more than 15 metres high, flying machines, or spectacles which turn the world upside down. German artist Höller, who originally trained as an agricultural scientist, is renowned for turning art galleries into playgrounds full of adults and children, making them shriek with glee and occasionally terror. Visitors and their children queued for hours in 2007 to go on his giant slides which shot them from the top level to the ground floor of Tate Modern’s enormous Turbine Hall. TV screenshot from the Big Brother house, ( ” live ” 3am bedroom cam ). Carsten Holler ( not a Belgian lager ), his mirror carousel… and yet another playground slide ( as planned for 2015 ) on the side of the Hayward gallery where visitors can exit the building in dizzying haste. Independent arts reviewer Zoe Pilger’s attempt at keeping her career on track despite by the looks of it disliking most of Holler’s Hayward. pieces. The mainstream media art agenda – pushing full page review spreads on identikit sterile tedium while stone-walling anything remotely new, challenging or truly authentic, out of fear of upsetting those in power and losing out on new job opportunities or even a royal gong 30 years hence. Almost the entire mainstream media – including perhaps especially arts reviewers – motivated essentially by fear of upsetting their own personal ripening little career apple carts.